When I hear about the possibility of a road trip, I start searching for a restaurant worth reviewing. Eating at a restaurant that serves real food, added with the bonus finding a place that sources local food, is my kind of fun. A few clicks of the computer produced a few possibilities but I was drawn to Kitchen Table because I liked their font. Yes, a font is a small thing, but that is how advertising works. I also found a favorable review from the Omaha World Herald. 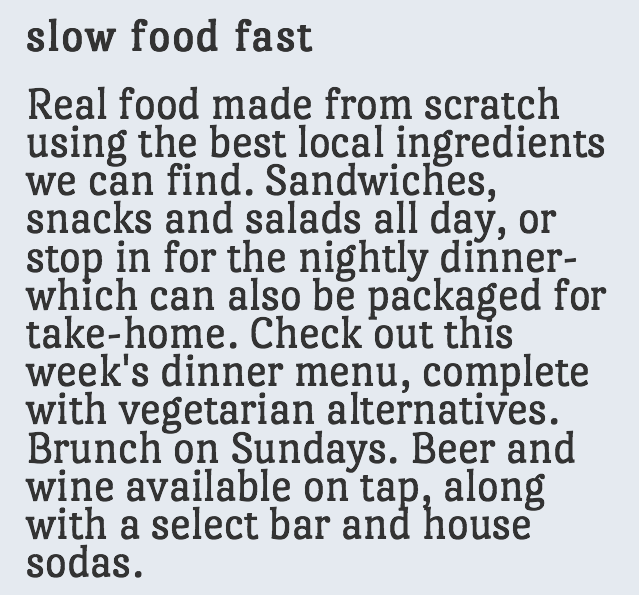 Slow food fast is how they described themselves on their website. Once we arrived in Omaha, I took a quick drive by and yes, the place looked worth visiting. They have nice windows in the front of the restaurant and the building looked interesting. Everything was in place for me to love this restaurant. However, I have been disappointed before so you never really know till you walk through the doors and finally taste the food. Big Muddy Urban Farm, Blooms Organics, Blue Valley Aquaculture, Branched Oak Farm, Burbach’s Dairy, Camp Creek Acres, GreenLeaf Farms, Myo Lean Piedmontese – Moenning Family Farm, Plum Creek Farm, Soup-N-More, Squeaky Green Organics, Truebridge Foods, Turner Acres. As I look through these different companies I think about how a small restaurant has the potential to introduce people to many individual family owned business. Each business is unique and worth checking out. The dinner special was a choice of regular grass fed beef or a vegetarian burger. We ordered the vegetarian burger. We have been ordering vegetarian more and more because we find that vegetarian chefs create flavors that are more inventive and interesting. I guess when you take away the fat and salt with many meat-y meals you have to add some seasonings and use great cooking techniques. We also had a sweet potato jam sandwich which came with popcorn. It was served on a excellent whole grain bread that might have even been sourdough. A kale salad with a lemon dressing was good because of the flavor and the way the kale was cut. The food was GOOD! If there were any improvements to be made, it would be in the choice of bun for the burger. It was a little crusty which works perfect for a juicy burger, but not so good for a vegetarian burger that falls apart on first bite. It is a complaint I have explained before. I left feeling full, satisfied and wanting to go back the next day. The flavor of the popcorn was a pleasant surprise. I noticed a bit of a licorice-y flavor which made me think: Fennel. When Steve stopped by to talk with the chef about the carrot “bacon” he mentioned the seasoning for the popcorn being the same as the seasoning he used to make the bacon. “Bacon” made from a thinly sliced carrot and baked with spices and added to the burger. See what I mean about vegetarian chefs being inventive. When we walked through the doors we were greeted immediately and directed to the menu on the wall. The two specials were described in fine detail. The restaurant is in a long narrow space with exposed brick on one side, concrete floors, and wood covered walls and a bit of green from the plant display. The kitchen is open and one could easily see what is happening. When our food arrived the whole staff delivered it to our table so as to make sure it arrived as quickly as possible. They did live up to their pledge of serving slow food fast. While ordering I noticed a business card for a company that takes down old barns for no charge. Later I discovered that this company made all their lovely wood tables. It all made sense, the name: Kitchen Table. They serve real food on real plates, and we sat at real wood tables. One thing that made me sad about my visit to Kitchen Table was that there were very few diners enjoying the place. Perhaps they are busier at lunch time since it is located in the Old Market District at 1415 Farnam Street.